Ghost Rider Marvel Video Slot Guide & Review - Casino Answers! Ghost Rider is a 5 reel, 25 line video slot machine with Wild and Scatter symbols, bonus game feature and three progressive jackpots. It is part of the Marvel Jackpot series. The slot machine is based on the Marvel Comics Ghost Rider comic book series, rather than the movie. 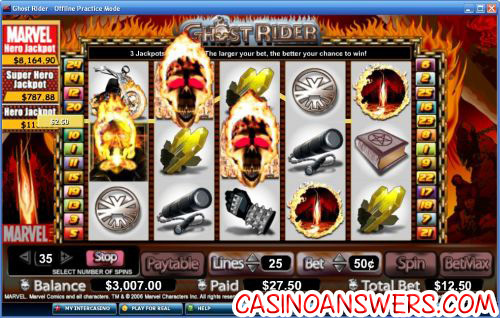 You can find Ghost Rider at any Cryptologic online casino, such as Casino Joy. In Ghost Rider, you can play from 1 to all 25 lines. Payline wins are multiplied by the amount bet per line and paid out according to the paytable. Scatter wins are multiplied by the total bet and added to the payline wins. Bonus game feature wins are added to scatter and payline wins. All combinations pay from left to right with the exception of the scatter symbol. Ghost Rider has a basic autoplay feature where you can select up to 99 spins to autoplay. Ghost Rider is linked to three progressive jackpots; Hero Jackpot, Super Hero Jackpot and Marvel Hero Jackpot. At the time of this writing, the Hero Jackpot was at $350, the Super Hero Jackpot was at $3,000 and the Marvel Hero Jackpot was coming up on $30,000. Each jackpot is won randomly. You can win them on any spin, even if you do not receive a winning combination. However, you will raise your chances considerably the more you bet per spin. Ghost Rider is an excellent video slot. The bonus game gives you a good chance to win a lot of money. From my experience, it did not take long to trigger it and I won almost 20X my bet. We recommend you try playing Ghost Rider at Casino Joy. Casino Joy is a newer online casino and has a 100% up to 150 Euro first deposit signup bonus. They also run additional promos all the time. I’m a US-based player. Are there any online casinos where I can play Ghost Rider for real money? Right now, Cryptologic-powered casinos such as Casino Joy are not accepting US players. That doesn’t mean you can’t have any fun, however. Try playing some of the interactive video slots called iSlots over at This Is Vegas Casino. 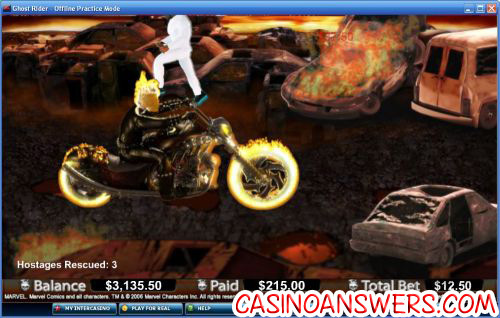 Is there any online casino Ghost Rider games?